Over the weekend the world lost actor and comedic genius Jerry Lewis. Jerry passed away on Sunday at the age of 91, and all of the sudden, the world feels a little less funny. Although he may not be here physically, his legacy will live on forever. One memorable moment of Jerry we have, is his iconic rock and roll parody scene in the 1958 classic Rock-A-Bye-Baby. Jerry and his fake band rock out with some hilarious dance moves and over the top fake solos! 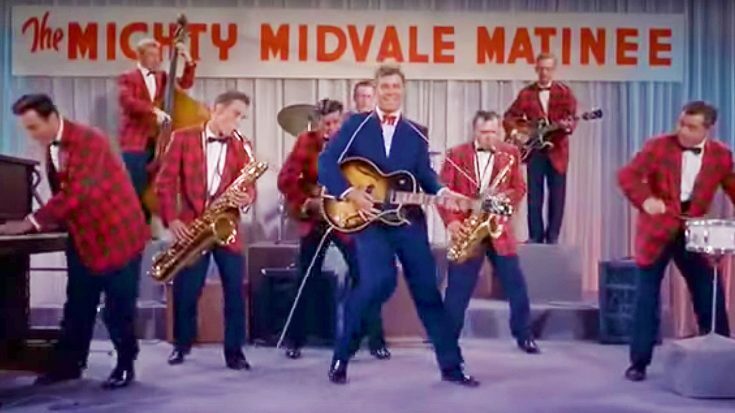 He’s clearly making fun of rockabilly bands, especially Bill Haley & His Comets who were very popular at the time. It’s an iconic scene and is bound to bring a smile to anyone’s face, and give them a pretty good laugh! We’re going to miss moments like this from Jerry the most, but we’re glad we have this memory forever! Check out the hilarious scene down below and let us know what you think!